The 15th National Outdoor Events Association (NOEA) Convention took place yesterday under the banner of the association’s ‘Commercialisation Project’ campaign. The theme for this year’s forum was ‘Create, Collaborate, Control’ and the event saw over 120 outdoor event professionals congregate across a day of convention and an evening awards ceremony. The day kicked off in style for the association with the unveiling of a new brand, identity and website that has modernised NOEA, but also that reflected the increased engagement activities the association has created for members over the last 18 months. The new brand features a vibrant fuchsia motif, with a host of different colours also available for members to use. The association was keen to keep the integrity of a what has become a ‘hallmark of quality’ for the events industry, whilst still giving members a contemporary new look and feel. The vibrancy of the new brand was reflected in the keynote talk of the day; Paul Smith, from the England & Wales Cricket Board, spoke passionately about his experience organising fan zones and activations from the Olympics, the Rugby World Cup, to the recent Women’s Cricket World Cup. Paul spoke intelligently about ‘giving people the best day of their lives’ and the role NOEA members play in supporting these high-profile occasions. Paul was followed by the culmination of a series of features supported by Futures Supporter GL events UK, on the importance of better client / customer conversations within the events industry. The panel bought together David Tunnicliffe, Commercial Director, GL events UK, Louise Young, Strawberries & Creem, and Becky Stevens, Hybrid Events, to summarise the key findings of this informative series. Marino Fresch, from NOEA’s latest Futures Supporter, Eventbrite, then jam packed a day’s worth of value into a riveting session on ‘marketing your event’, sharing some of the latest tactics, statistics and insights into commercialising through ticket sales. 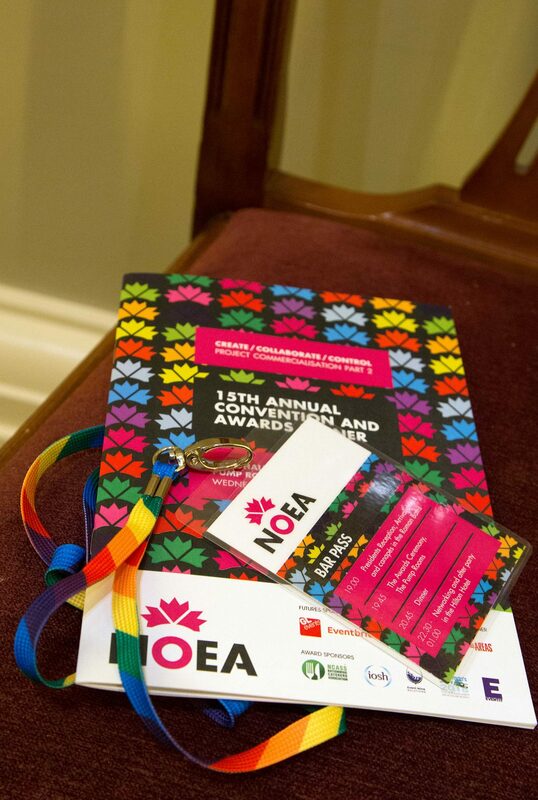 The NOEA Convention then presented three breakout sessions, allowing attendees to choose their own content and pick topics most relevant to them. Jill McCracken, also from the ECB, talked about security, while Dr Caroline Jackson presented a campaign on Creativity in Events as part of two of the sessions. The final session involved yet another Futures Supporter, Phil Atkins, Managing Director of ACT International, who created a discussion group around health and safety, a key subject of NOEA members. The afternoon sessions included two heartfelt presentations from Gill Tee, entertee, and Louise Young, Strawberries and Creem, on their own experiences in the events industry, and how they have learnt and progressed through collaborations, and the creation of new events and experiences. These presentations allowed attendees to better understand the anguish, risk and reward directly from the event organiser. The day was completed with two high energy presentations from Adam Goodyer, LiveStyled, around the technology available to event professionals, and how it can be better commercialised; and Nick Morgan from We are the Fair, who talked about the changing face of brand marketing and how the industry can better work with brands at their events. NOEA once again presented a packed agenda of new learning, and interactive debates for event professionals looking to progress their businesses and create more commercial gain in the events industry. The day was followed by what has become one of the industries most decorated awards ceremonies, which again recognised businesses for their innovation, and business success. The events have become such a high-profile occasion that James Heappey MP, Chair of the All Party Parliamentary Group for Events, took the time out to come along at the back end of the day, post Budget, to present a number of awards, only return to Westminster later in the evening. The NOEA Convention once again took place in The Guildhall and The Pump Rooms, in Bath.